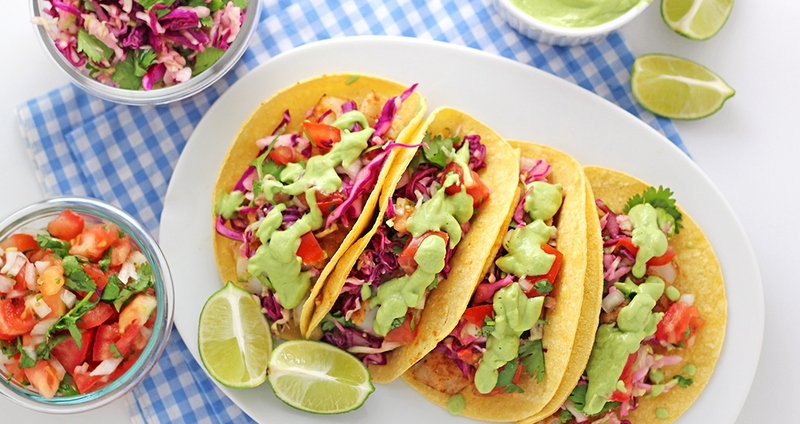 These fish tacos are great for summer entertaining, as they come together quickly and are always a crowd pleaser! Instead of sour cream, this dish uses avocado “cream” as a smooth, dairy-free topping that everyone can enjoy. Add the cashews (for the avocado cream) to a small bowl and cover with water. Set aside to soak. To prepare the fish, place the smoked paprika, cumin, onion powder, garlic powder, sea salt, safflower oil and lime juice together in bowl. Place fish in a medium glass dish. Pour the marinade over and let marinate in the fridge for 15 minutes. Next make the slaw by tossing the cabbage, cilantro, lime juice and sea salt together in a medium bowl. Make the pico de gallo by tossing the tomatoes, onion, lime juice, cilantro and sea salt together in a separate medium mixing bowl. Then make the avocado cream by draining the water from the cashews and adding them to a blender. Add the avocado, lime juice, sea salt, cilantro, jalapeño and water. Blend (adding additional water, a tablespoon at a time as needed) until the cream is smooth and the texture of sour cream. Set aside. Preheat grill to medium-high heat. Remove the fish from the marinade and place onto the grill. Grill for 4 minutes; then flip and cook for an additional 4–5 minutes, or until the internal temperature reaches 145 degrees F.
Once fish is cooked, remove from grill and set aside. Place the tortillas on the grill, and grill for 15–20 seconds, until warm. Divide the fish among the tortillas and top with the cabbage slaw, pico de gallo and avocado cream. Serve immediately.